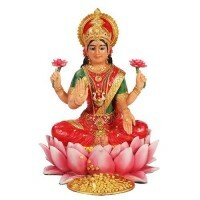 Lakshmi, the Hindu Goddess of Luck and Wealth, is beautifully depicted in this 10 inch color statue. Lakshmi is the Goddess of luck, wealth and beauty to the Hindus. She is the household goddess of most Hindu families and a favorite among women. 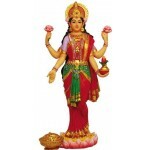 This cold cast resin statue of Lakshmi is 10 inches high with amazing, hand painted color detail. 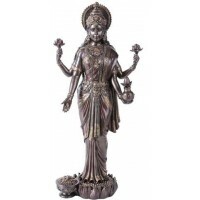 Item Number: PT-9325 | Approximate Size (Inches): 5.50 wide x 3.25 deep x 10.00 high | Approximate Shipping Weight: 3.00 lbs.